Since returning to Fukuoka I've been cleaning house, going through 12 years worth of accumulated stuff and finding that we should have gotten rid of most of it as soon as we had finished with it, or had declined it when offered. I suppose Mutsumi and I are not the only ones to do this, to hold on to things thinking that perhaps we will again someday have a need for them. My experience is that most of the time, this isn't the case. I've opened box after box of books, music, photos, letters, student papers, teaching materials, clothing, bags – none of it touched since the day it was consigned to cardboard and a spot in the closet. And still, some of it is hard to part with, even though I know it is going to go back in the box, never to be seen again until I start one of these cleaning exercises again in 2015 or 2020, should I live so long. I suppose I'm fortunate to be doing this now instead of during a one-week vacation from work when there's not so much time to stop and read an old letter, or glance through a pile of old photos. Otherwise, I might just be chucking stuff into the trash heap just to be done with the project. 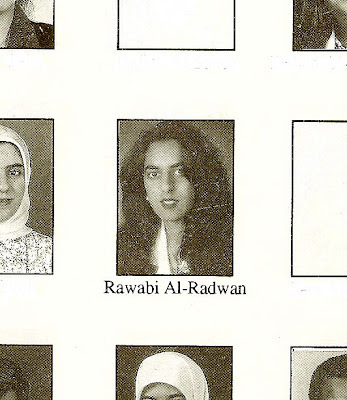 Among the boxes was one carried over from Kuwait, where we lived from 1995-96. Therein was a notebook of clippings from the Arab Times, our daily source of news and entertainment at a time when the internet was still not widely available and many of us still read newspapers. Amidst other amazing stories was the tempest stirred up by religious fundamentalists over a Hagar cartoon published 25 March 1996 in which the barbarian complains to God, "I pray and pray, but you never answer me", to which God replies, "Sorry if you don't get through right away. Keep trying. These days everyone wants to talk to me." For mocking God, a group of six men visited the newspaper, one pulled a gun and fired at the editor. The gun jammed and all fled. Other brouhahas erupted over attempts to segregate education, women's suffrage, and fashion shows. Among the more amusing stories are those with a morally indigent tone relating the rising tide of eve teasing, in which young men try to give young ladies pieces of paper on which they have written their names and telephone numbers. But perhaps the strangest story was the one about the Indian fellow arrested for dressing like a woman so that he could sit next to his girlfriend and her mother in the movie theater (which in Kuwait and other Gulf countries have segregated seating). 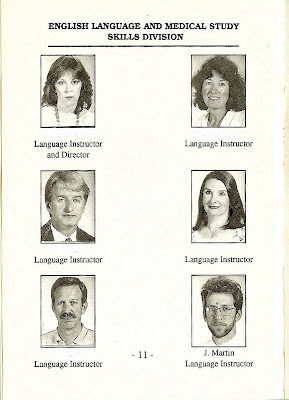 There was also the Kuwait University Handbook from 1995-96, in which I found staring back at me a face that is at once familiar, but then again not. 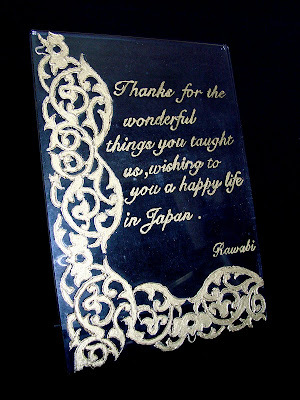 Flipping through I saw Rawabi, one of my students who gave me a gift that sits now on our bookshelf and which I see at least a few times every month, a placard on which she inscribed: Thanks for the wonderful things you taught us, wishing to you a happy life in Japan. It's been 15 years since I've seen her and I suppose she now has a family and is practicing medicine somewhere in the Gulf. It would be nice meet her again. We traveled to Egypt during this time and along the way Mutsumi was practicing her new hobby of painting, the choice of which I suppose was influenced by our upstairs neighbor, an American woman by the name of Norma who had painted all kinds of stuff all over her apartment walls. When I finished my thangka last month Mutusmi said she could never have imaged I had such ability. But looking at her painting here, I think she's shown a little talent of her own, don't you?